Midnight Rising | A Practical Peacemaker Ponders . . . 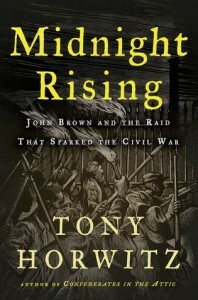 Midnight Rising: John Brown and the Raid that Sparked the Civil War, by Tony Horwitz. Henry Holt & Co., 2011. Having grown up in eastern Kansas, I’ve been fascinated by John Brown ever since I saw, as a school child, the stunning mural of him in the Kansas State Capitol building. (The painting is “Tragic Prelude” by Kansas artist John Steuart Curry.) When I learned that Horwitz, one of my favorite historians, had taken up Brown’s story, I knew I had to read it, and what better time than on the anniversary of the Harpers Ferry raid Oct. 16? Horwitz presents thorough and impeccable research, gives his readers the necessary background, and then relates events simply and clearly. Regarding Brown, who can fail to be moved by someone who lays his life on the line to oppose injustice when all odds are against him? And who later, refusing friends’ attempts to rescue him from jail as he awaited execution, chose martyrdom as the most effective blow he could strike against slavery? Whether or not one agrees with his tactics, he stands as a towering figure speaking truth to power at a critical point in American history, and as a source of inspiration in the ongoing struggle of oppressed peoples for freedom.